Find the best time to meet with your team inside and outside Slack in the easiest way possible. Doodle Bot gives you back your time!1. 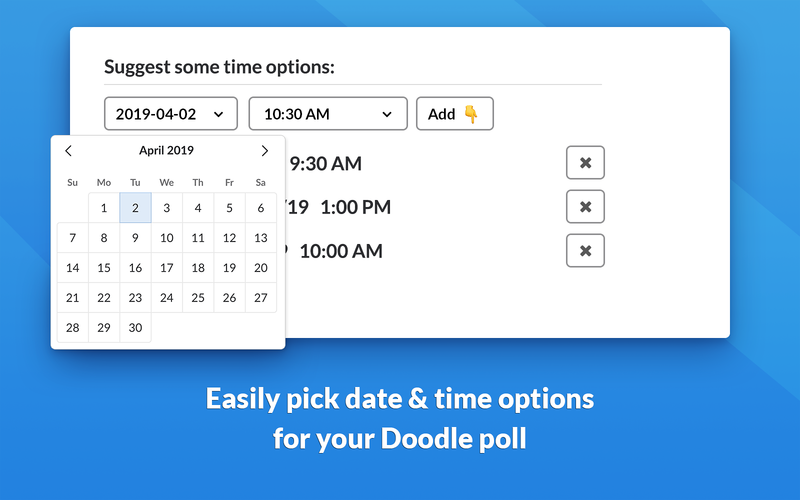 :spiral_calendar_pad: Suggest times for your meeting - Add a few time options to your poll invite.2. :busts_in_silhouette: Invite participants - Invite channels, members, email contacts or use the shareable link anywhere.3. :ok_hand: Select the best option - Once the availabilities are in, pick the time that works for everyone and voilà! 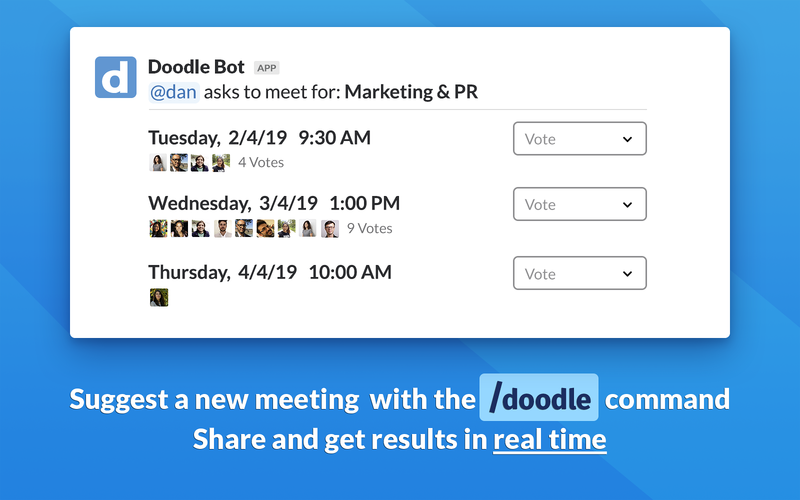 Forget about juggling between calendars and chat services, jumping between tabs or resending invites - use Doodle Bot to create and manage meetings where you work.Gone are the days of following up or rescheduling. Instead of wasting time chasing people or circling back on endless email threads - send one message with a list of possible time options. Have participants vote based on their availability, and select the time that works for everyone. Done.No group is too big (or small) for the mighty Doodle Bot. Whether you’re planning a team meeting, an all-hands event, or setting up an interview - we’ve got you covered. 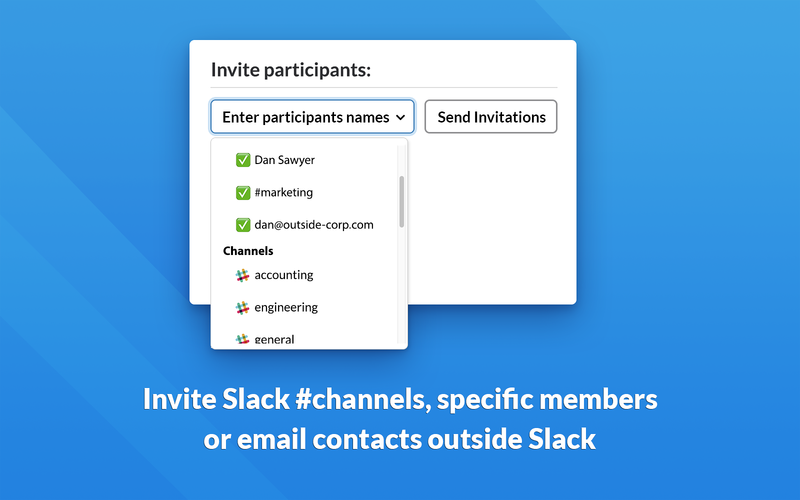 Easily invite entire Slack channels, individual members or external email contacts. 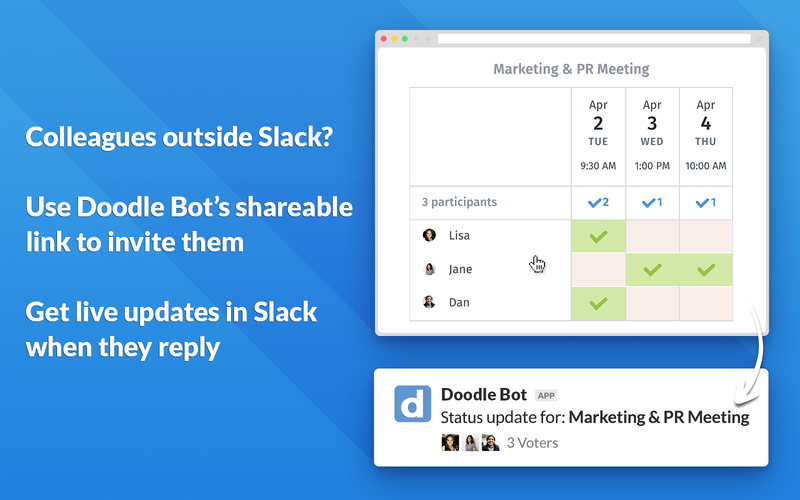 Once everyone votes, you’ll receive their availabilities in a poll-like view, making it crystal clear to see and pick the best option possible.Use Slack commands to manage all your meetings. Type /doodle list to see all your meetings and participant replies. 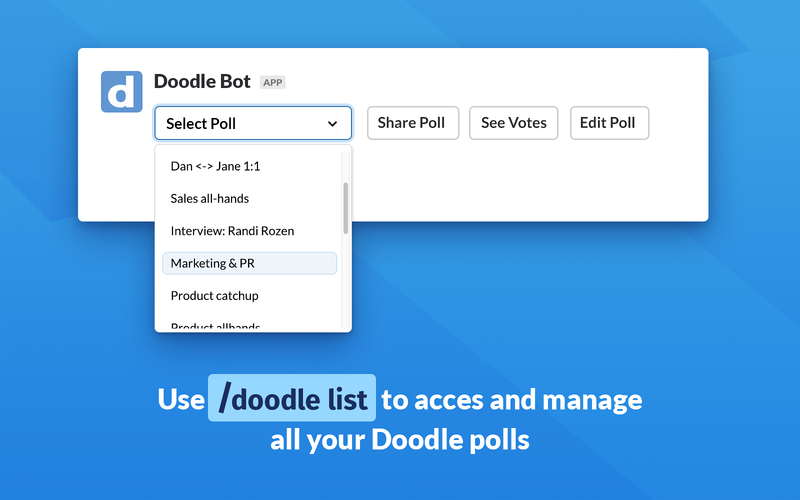 :heavy_plus_sign:If you already have a Doodle account, connect it to Doodle Bot to manage all your meetings in one place, without having to jump between tabs or apps.You don't have to monitor response emails. 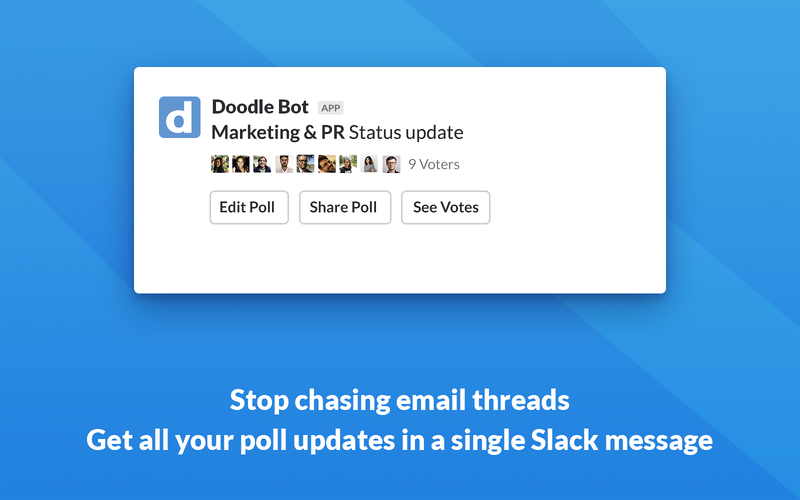 Get Slack notifications about your poll updates in real time.While meetings will always remain a part of our work lives, the time spent scheduling them doesn't have to. So let's make meetings happen, in Slack! 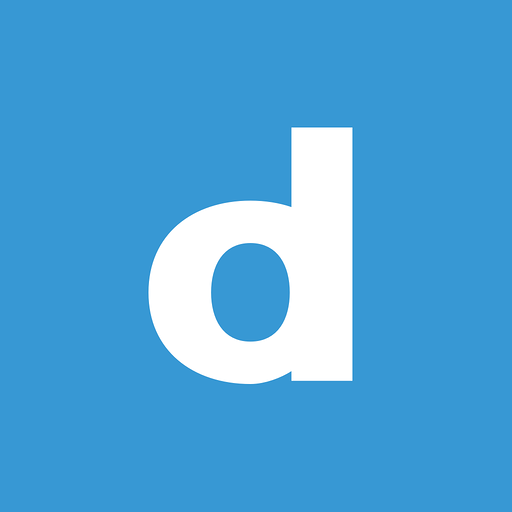 Doodle Bot will be able to install a bot user that appears in and has access to your workspace’s directory. It can also post messages and view activity on messages in any channel it is invited to.